The very distinct Arafura Fantail until recent times has been regarded as a variant of the Rufous Fantail, but probably because of its fairly restricted range in coastal northern Australia it has never attracted much attention. Within Australia there are just these two closely related species but further north throughout the islands and in New Guinea the situation with this group of fantails is much more complex - there are many more species and some disagreement about their relationships. This is all summarised fully in the Directory of Australian Birds by Schodde and Mason. 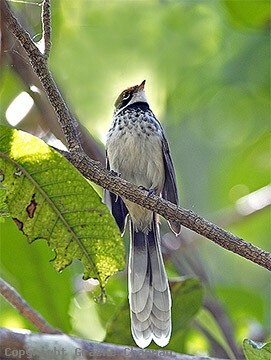 In Australia, Arafura Fantails occur in humid places in the far north, from Derby in W.A. right across to the west coast of Cape York up as far as Aurukun - ideal habitats are mangroves, monsoon forest, vine thickets and riverside scrubs. By comparison with Rufous Fantails, their long, white-tipped tail is conspicuous but the two species are not likely to be confused because the only place where they could occur together is in the vicinity of Aurukun, not easily accessed! Arafura Fantails are fairly sedentary and occupy their territories as simple pairs. 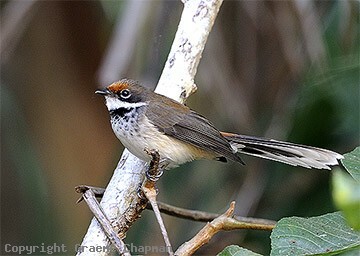 Otherwise their feeding and nesting habits are similar to those of Rufous Fantails. 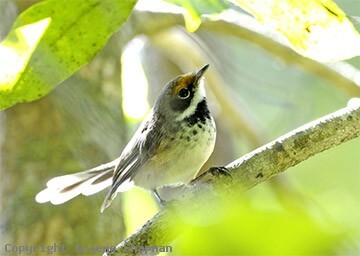 Their calls however, are quite distinctive and different from those of the Rufous Fantail (listen on sound page). 718201-D ... Arafura Fantail - note the long, white-tipped tail.